Rene Colato Lainez, a recognized children’s book writer, and Teacher in the “Fernangeles Elementary School” of the Los Angeles Unified School District called into Cafe Con Leche on Thursday, January 17, 2019, during the 4th day of the strike. He told us that the Union and the Superintendent were going to meet again the same day and that LA Mayor Eric Garcetti was going to help to reach an agreement. Rene explained to us the Teachers’ demands that included more staff to provide a better education for children and a fair salary increase. 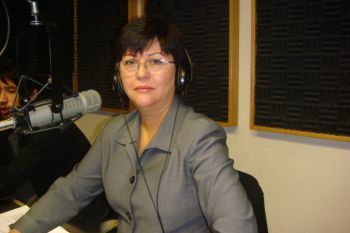 He will continue informing Cafe Con Leche’s listeners about the advances in the negotiations. René Colato Lainez, un reconocido escritor de libros infantiles y profesor de la “Escuela Primaria Fernangeles” del Distrito Escolar Unificado de Los Ángeles, llamó al Café Con Leche el jueves 17 de enero de 2019, durante el cuarto día de la huelga. Nos dijo que la Unión y el Superintendente se iban a reunir nuevamente el mismo día y que el Alcalde de Los Angeles, Eric Garcetti, iba a ayudar a llegar a un acuerdo. Rene nos explicó las demandas de los maestros que incluían más personal para brindar una mejor educación a los niños y un aumento salarial justo. Rene continuará informando a los oyentes de Cafe Con Leche sobre los avances en las negociaciones.